Rather than using the conventional microscope camera + laptop computer for capturing images under the microscope, you may want to consider using a microscope tablet camera. The microscope tablet camera is available in both a 7" and 9.7" tablet. The 9.7" camera tablet includes advanced measuring software. Boom stand stereo microscope with tablet camera. Android tablet with touch screen (can be used for other applications). Built-in c-mount threads that connect to microscope c-mount adapter. Larger screen directly on microscope, rather than having to use cables and place a computer near the microscope system. 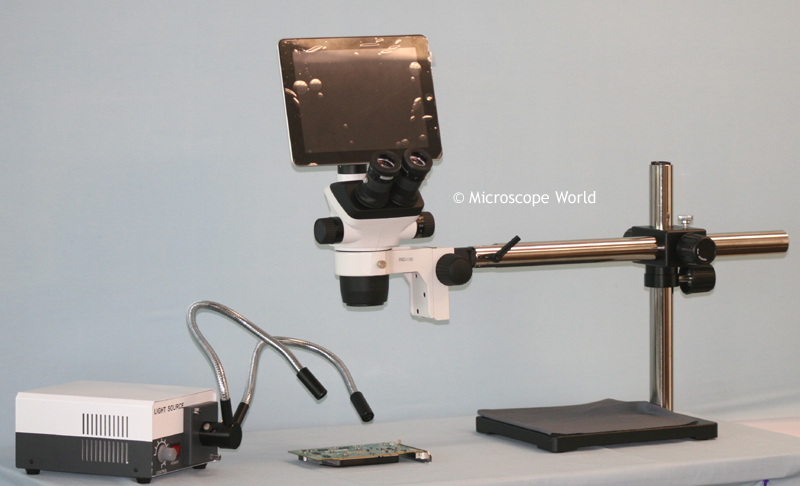 If you are interested in a quote on a tablet microscope system, please email Microscope World.